The hiking offer around the Elfer now is richer by one attraction. Where other resorts burden guests with (over)loaded weekly programmes, the Geh-Zeiten-Wege in the Elferlifte hiking area take visitors on a journey through time. Coming to a halt, discovering natural cycles and listening to your own inner clock again – when hiking the Geh-Zeiten-Wege you combine active recreation with a reflection on your own grasp of time. 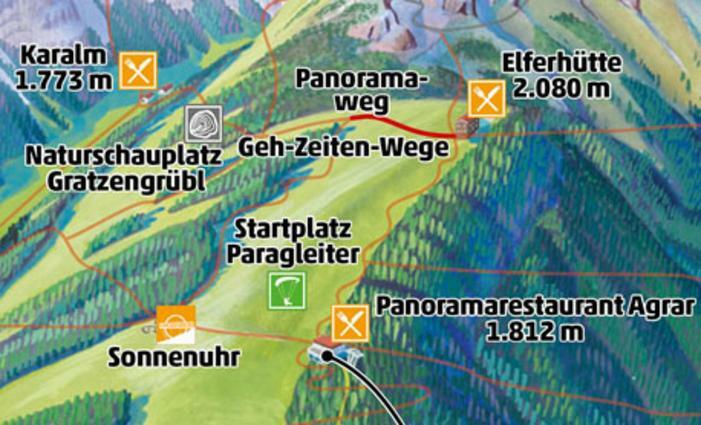 The Sonnenzeit Geh-Zeiten-Weg starts at the largest accessible sundial of the Alps. Not only the wonderful view, but also the ancient technology of time measurement with the sun’s help fascinate visitors here. We realise what an important role the sun plays and can almost feel the calm rhythm of the earth revolving around the bright cosmic body. When leaving the sundial, past the old Kochhütte you reach the Panoramaweg. Different stations along the way are dedicated to time units from the second to the year. Hikers develop a new, more conscious feeling for time, creating a unique experience in combination with the magnificent scenery around the Elfer. From the Elferhütte the second Geh-Zeiten-Weg called “Blütenzeit” leads along the Panoramaweg up to the fork of the Elfer circular hiking trail. Here, hikers learn amazing facts about flowers and the alpine fauna’s own cycle of life. “Why is this flower blue, and the other one red?” “What do flowers do when it snows?” ”Why do berries taste so sweet?” Especially children analyse their environment and everything they see. The information provided on the flowery splendour satisfies this thirst for knowledge in an entertaining manner and points out the various meanings of the world of plants for local agriculture and as a valuable part of the recreational area. As longest of the three Geh-Zeiten-Wege, the Steinzeit trail leads up to the Karalm at 1,737m and takes hikers through the geological zones at the Elfer. The slow, but constant changes of the mountain world can be read from the rocks and provide an indication of the earth’s age. At the end of the exciting tour refreshments and a mountain hut await hikers at the Karalm.